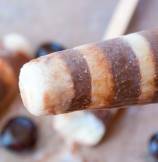 Sharing with you organic raw cocoa and cream Ice Pops with almonds - a sweet and chocolaty (healthier) frozen treat for kids! One thing that this gorgeous and yummy Ice Pops want is patience. Patience?? yes! I will not lie to you. 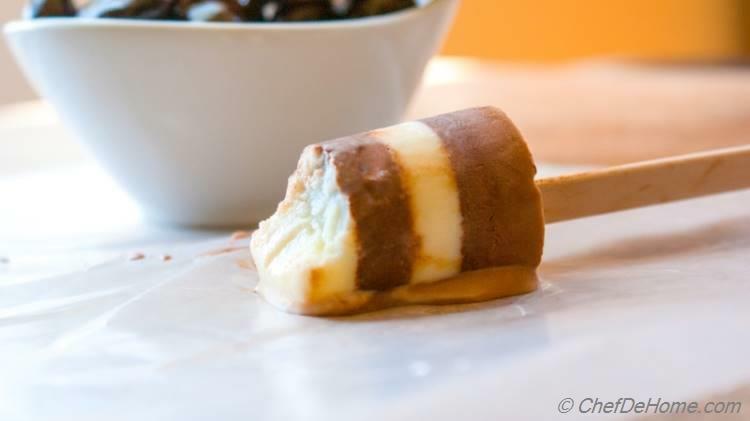 The ingredients for Cocoa Ice Pops are ready in 15 minutes and then if you only want Chocolaty Cocoa Ice Pops, just pour in molds and freeze'em until ready to serve. Or if you want to have zebra bands like I did, fill each layer after freezing other for 30 minutes. With these zebra bands, it is certainly a weekend project. I must say, it is worth all patience!! Creamy sweet milk layer balances the dark and slightly bitter cocoa layer perfectly. 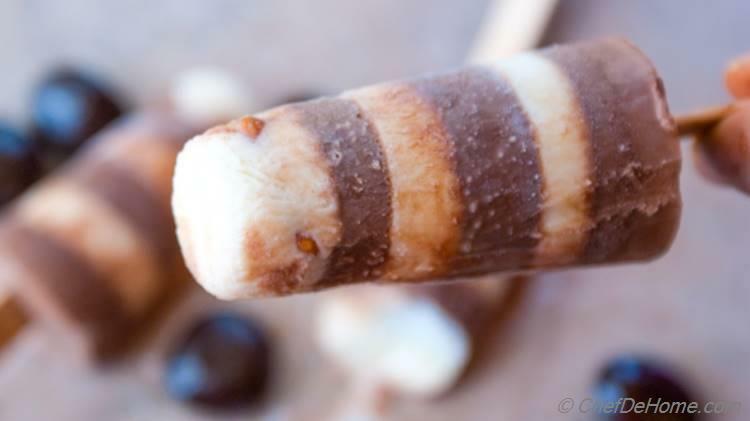 Since layers are alternate, you keep hitting bitter and sweet all way through with delicious findings of crunchy almonds as you move on to explore this Ice Pop Adventure!! I bet kids will love it!! Even though it has good serving of Raw Cocoa Powder (and a hidden health gem of raw almonds), these Ice Pops does not taste boring or bitter at all. By-the-way, does Ice Creams or Ice Pops ever taste boring to kids? I don't think so!! Really!! Kids and Ice Cream (specially chocolate), I am word-less!! 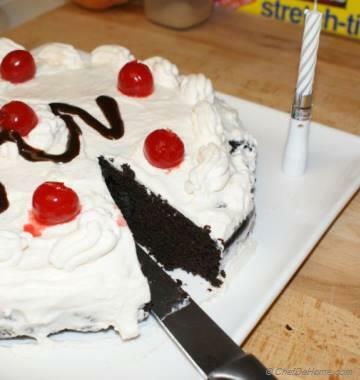 Exactly like Vishal and sweets (specially chocolate ice creams), I am speech-less!! These egg-free and no-heavy cream ice pops with good serving of dark organic cocoa and raw almonds gives me mental satisfaction that he is not eating junk. I guess this strategy will work with my kids too one day :) Not sure.. ?!?! 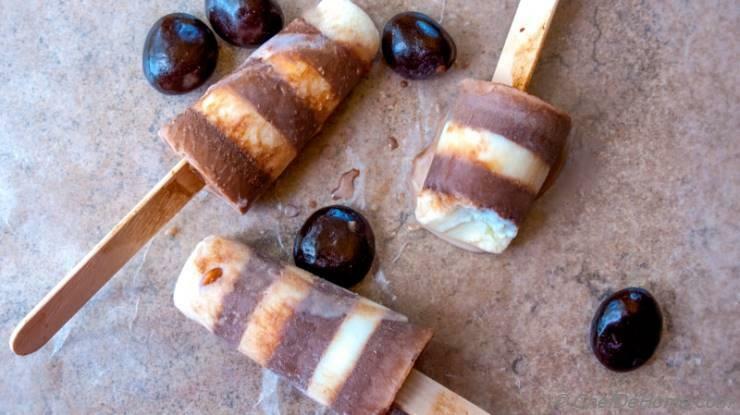 I hope you will enjoy making these Cocoa Ice Pops and have fun with kids and family this weekend. Until we meet next week, happy weekend and Happy Father's Day to you all! Smart Swap Replace Whole Fat Milk with 2% milk to save some calories. 1. Bring milk to a simmer, add cardamom and condensed milk. Stir well to combine, then continue simmering at medium low heat for 10 minutes or until 2.5 cup liquid (2 cup milk and 1/2 cup condensed milk) has reduced to about 1 and 1/2 cup total. 2. Remove from heat. Discard cardamom. Divide the mixture in two jars. In a small bowl add 4 tbsp cocoa and 4 tbsp hot milk from one jar. Whisk well to avoid any lumps. Mix this cocoa mixed milk in jar from where you took the milk to mix in cocoa. Let both liquid come to room temperature. 3. In eight 1/4 cup ice pop molds, pour 1 tbsp of sweet milk and 1 almond in each mold, freeze for 30 minutes. Mean while, keep both cocoa and white milk jars in refrigerator. After 30 minutes, top each mold with 1 tsp of cocoa milk and return to freezer again. 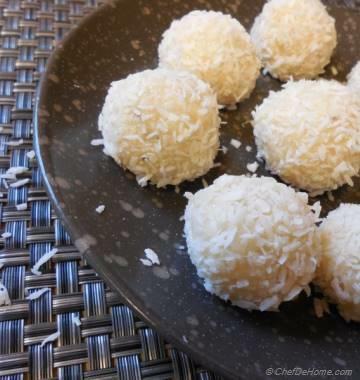 After 30 minutes, gently insert in pop sticks, then top with 1 tsp white milk. Add 2 more alternate layers of 1 tsp cocoa milk and milk and last one with 1 tbsp cocoa milk. Freeze fully until ready to eat and enjoy!! You can reduce the number of layers to save time. Make half milk and half cocoa or 4 layers with two milk and two cocoa. 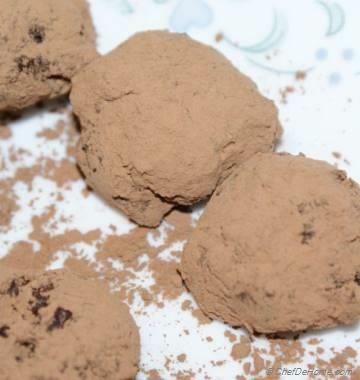 If you cannot find raw cocoa powder, you can also use 60 percent dark chocolate powder. I usually use Hershey Brand. @Farin, thank you so much!